When I first saw the idea for a Dynamic Duos themed blogathon on Classic Movie Hub Blog, a number of classic pairings immediately came to mind. Batman and Robin? Too obvious. The two killers from Hitchcocks' classic 'Rope'? Already been done to death. In the end, I realised that I needed to choose a duo who no one else would ever think of. It might seem quite random at first but to me, Maleficent and Diablo are clearly one of the best pairings in cinematic history and are certainly the strongest villains found in any Disney film. The dynamic duo first appeared together in Disneys' classic fairy tale 'Sleeping Beauty'. Released in 1959, the film initially didn't perform as well as expected in either the commercial or critical stakes, so it became the last fairy tale released by Disney up until 'The Little Mermaid' was produced thirty years later. Maleficent is the perfect Disney villain. Voiced originally by Eleanor Audley, the evil sorceress steals every scene she's in with her striking character design and malicious intent. The voice acting is just extraordinary in this film and if there was ever an Oscar for Best Voice Acting then Eleanor Audley would have been a definite contender back in the day. Maleficent is one of the most influential adversaries of the entire Disney canon and her character design has become the go-to template for animated villains ever since. You only have to take one look at Ursula from 'The Little Mermaid' to see the similarities and Charlize Therons evil witch from 'Snow White and The Huntsman' bears more than just a striking resemblance to Maleficent. Don't even get me started on Queen Narissa from 'Enchanted'! But why are Maleficent and her crow such a classic Disney pairing? Diablos' presence at his masters side is constantly unnerving and he's one of the few sidekicks who actually succeeds in every task he is given. Although Diablo never actually speaks, his squawks play a key role in 'Sleeping Beauty', when he alerts Maleficent to Aurora's hiding place. Diablo and Maleficent are rarely seen apart, even in the Disney animated series 'House of Mouse'. Check out this episode below where Hades tries to get it on with Maleficent. Why anyone would fancy an old witch who forever has a dirty bird sat on her shoulder is beyond me, but each to their own I say! Maleficent and Diablo may not be a dynamic duo in the traditional sense but the bond between the sorceress and her familiar is undeniable. The two even share the same fate at the end of 'Sleeping Beauty', when the forces of good overpower and ultimately destroy the pair. While Diablo is turned to stone by the fairy Merryweather, Maleficent endures a more gruesome fate at the hand of Prince Philips' sword. The dynamic duo endured beyond their cinematic demise however and can be seen together in other Disney media; most notably in the 'Kingdom Hearts' computer game series as the main antagonists. Maleficent and Diablo are set to return to the big screen in 2014 in their own film which focusses more exclusively on the evil pair. Robert Strombergs' take on the iconic duo stars Angelina Jolie in the title role with Sam Riley in a supporting role as Diaval, Diablos' human counterpart. The character has been re-imagined for this live action movie as a raven who can take on human form to complete Maleficents' bidding. Jolie seems perfect for the title role and Riley is a great choice to bring credibility to what sounds like a pretty bizarre part. So what do you think of Maleficent and Diablo as a duo? How do they match up to other classic Disney pairings like Jafar and Iago or Ursula with her eels? And are you looking forward to the upcoming live action 'Maleficent'? Let me know what you think by commenting, liking and sharing below. I liked that your Dynamic Duo was completely unexpected, and I think they are a great duo. Disney's female villains, in my opinion, ALWAYS steal the show. Sometimes the "goodness" of the princess du jour gets to be a bit much, no? Definitely! I think some of the best Disney films are so great BECAUSE of their villains. Ursula, Scar, Hades...the list goes on. Thanks for the blogathon, great idea! Thanks so much for reminding me of the greatness of Disney. I don't watch these as often as I should and forget the absolute artistry of these productions. In watching the clip of Maleficent's best lines I felt chills down my spine. What a robust characterization. Truly a standard. (And especially scary to me, I might add, because - you know - Sleeping Beauty's name is Aurora). And, choosing Maleficent and Diablo as THE chosen duo is genius. Wonderfully unique. Thanks so much for entering this to the Dynamic Duos blogathon! Thanks Aurora, I appreciate the kind words. 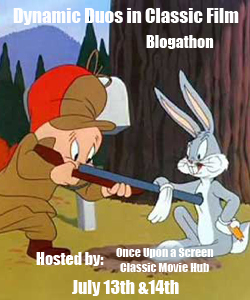 I loved the idea for this blogathon and wanted to come up with something a bit different. Maleficent really is the perfect villain and it was fun to write a more unusual post. Oscars: Best Actress 1950 - Who Should Have Won? I Love The 90s: Fashion. John Wyndham: Why 'The Chrysalids' is his best book... and not 'The Day of the Triffids'! The Women of Nine: Who's The Best? Terms and Conditions; All content provided on this blog is for informational purposes only. The owner of this blog makes no representations as to the accuracy or completeness of any information on this site or found by following any link on this site. The owner will not be liable for any errors or omissions in this information nor for the availability of this information. The owner will not be liable for any losses, injuries, or damages from the display or use of this information. Be Careful! Your Hand! claims no credit for any images posted on this site unless otherwise noted. Images, music and quotes are believed to be published according to the U.S. Copyright Fair Use Act (title 17, U.S. Code.) If there is an image appearing on this blog that belongs to you and do not wish for it appear on this site, please E-mail with a link to said image and it will be promptly removed.